Have you heard about all of the classes and activities offered here at the Youth Performing Arts Center (YPATC), but still have a few questions or unsure of whether this is the right place for your child(ren) to attend? If so, come on out to the YPATC's open house on July 20th, from 6:30 pm-8:30 pm, where all of your questions will be answered. Here, you will get the chance to meet Ryan Ace Music and its wonderful team of instructors, as well as the YPATC's other affiliates. Some things that will be discussed include, the various classes/lessons offered, the prices, and the business hours these classes/lessons are held. You will also get to know more about the company Ryan ace Music, its non-profit foundation, involvement within the community, fundraisers, and the Music Shop where you can shop for music supplies that your child needs. What benefits does music bring to your children? There is a wide range of neuroscience research that explains how children who are exposed to music have a larger growth of neural activity than those children who aren't introduced to music. Why? This is because music involves more than the voice or instrument, it involves the brain. Learning how to read music is difficult, and takes a lot of practice. Ever try learning how to play the piano? It takes more than one day to perfect the beautiful instrument. We are often fascinated by the young prodigies because learning how to play any instrument is not an easy task. There are several skills a child must learn before being able to play an instrument, but while children learn these musical skills, they are also developing other skills. One of these skills is language development. When a child is studying music they are using the left side of their brain that is known to be involved with processing language. "While children come into the world ready to decode sounds and words, music education helps enhance those natural abilities" as said by Mary Luehrisen, executive director of National Association of Music Merchants (NAMM). This is seen most prevalent in those children ages two to nine because this is when children begin to learn how to speak and carry a conversation. Another skill that is enhanced when a child learn music is spatial intelligence. This allows children to conceptualize components that should go together. This skill is often linked with math. When a child learns how to play a specific song, they are piecing together many parts of their musical abilities. In the video provided below you can watch a young girl develop a beautiful melody with only four notes. This is a beautiful example of spatial intelligence and music. Beside the fact that music can enhance a child's skills, it can also make a child happy. 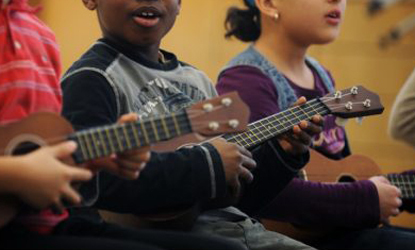 There are more than just brain benefits that come from musical education at a young age. Music is a fascinating art that can bring joy to anyone, and being able to respect music with a deeper understanding is a benefit in itself. I would like to thank PBS for publishing the article that provided me with all this wonderful information. Click LEARN MORE to be directed to this article.